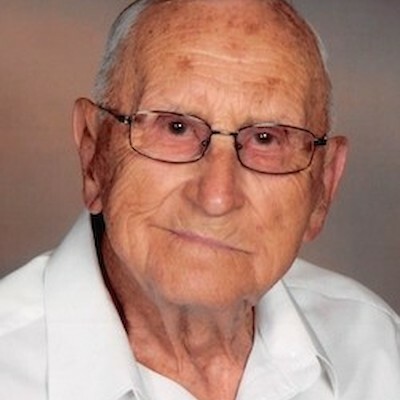 Harry Burton Nelson, 98, of Cumberland died Saturday, February 9, 2019 at Care and Rehab-Cumberland. He was born July 5, 1920 in Minneapolis, MN to Harry Burton and Emily (Severson) Nelson. Harry graduated from Cumberland High School in 1937. He went on to the University of Wisconsin-Madison where he took an Agricultural Short Course. He then worked as a Dairy Herd Improvement Fieldman in Barron County for 2 1/2 years. In 1940 he moved to St. Louis Park, MN where he was a school bus driver and Pure Oil Service Station Manager/Leasee for 9 years. His future wife walked by the station everyday and, after seeing her, he arranged a date. He was married in Hopkins, MN on September 21, 1946 to Jeanne Larson who preceded him in death on September 9, 2014. Together, they moved to Cumberland in 1950. Harry then took a job with 3-M where he worked his way up and became a supervisor. He worked there for 31 years. Harry was a lifetime member of St. Paul Lutheran Church. He served as Chairman, Elder, Financial Secretary as well as Ushering for 40 years. He enjoyed the Men's Morning Bible Break and was a member of Lutheran's for Life. Harry's favorite pastimes included lawn mowing and car washing; his car was his pride and joy. After Harry's retirement, he thoroughly enjoyed being a part of his grandson's lives and loved supporting them in their sporting events. He is survived by 2 daughters: Barb (Greg) Gunderson of Rice Lake, Sharon (William) Ekenstedt of Cumberland; 4 grandsons: Gabriel (Tracey) Gunderson, James (Krisha), Mark and Steven (Lydia) Ekenstedt; Great grandchildren: Abrielle Gunderson, Reece Gunderson, Kayla Ekenstedt and Emilia Ekenstedt. Funeral services will be held at 11 AM Saturday, February 16, 2019 at St. Paul Lutheran Church, Cumberland with Rev. John Miels officiating. Burial will be in Lakeside Cemetery, Cumberland. Pallbearers are Gabriel Gunderson, James Ekenstedt, Mark Ekenstedt, Steven Ekenstedt, David Ekenstedt, Jonathan Ekenstedt and Reece Gunderson. Visitation will be one hour visitation prior to the service at the church. Skinner Funeral Home of Cumberland is serving the family.